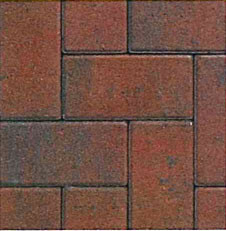 This block paving from Eatons comes in a lovely Multi Brick colour and is the perfect choice for a driveway project. This block paving is also available in 50mm depth. STEP 1: Where will the paving be located? STEP 2: Enter the width and length, or enter the area(m2) if you already know it. Our bulk bags of concrete sand vary from 850kg - 1000kg. Many other retailers can only offer a variance of 700kg - 1000kg. Due to this variance a project is always likely to complete with slightly too much or too little sand. If the base beneath the sand is not even, this can also cause you to require slightly more sand. Calculation rounded up to the nearest full bag. This result is calculated from rolls of weed membrane covering 14m2. Calculation rounded up to the nearest full roll. Our bulk bags of sub-base vary from 850kg - 1000kg. Many other retailers can only offer a variance of 700kg - 1000kg. Due to this variance a project is always likely to complete with slightly too much or too little sub-base. Calculation will not be accurate for uneven land or land on a gradient. We always recommend getting advice from a professional landscaper. Quantities are estimated based on perfect working conditions. We do not take responsibility for excess materials. Binds to the paving slabs while providing a surface which cushions the pavers, accommodates any variation in thickness between different slabs, and ensures that the finished surface is smooth and even. A foundation of 40-50mm compacted sharp sand is required before laying your paving. Weed membrane can be used to prevent the growth of weeds between your paving, vital to keep your paving looking new. When compacted correctly the sub-base has a huge load-bearing capacity, capable of supporting the weight of vehicles by spreading the weight over a wider area. A foundation of 100mm is required for wet or unstable ground, while 150mm is required for domestic driveways.